Titanic 3D is a stamp celebrating that on 15 April 2012 it was 100 years since the Titanic sank. 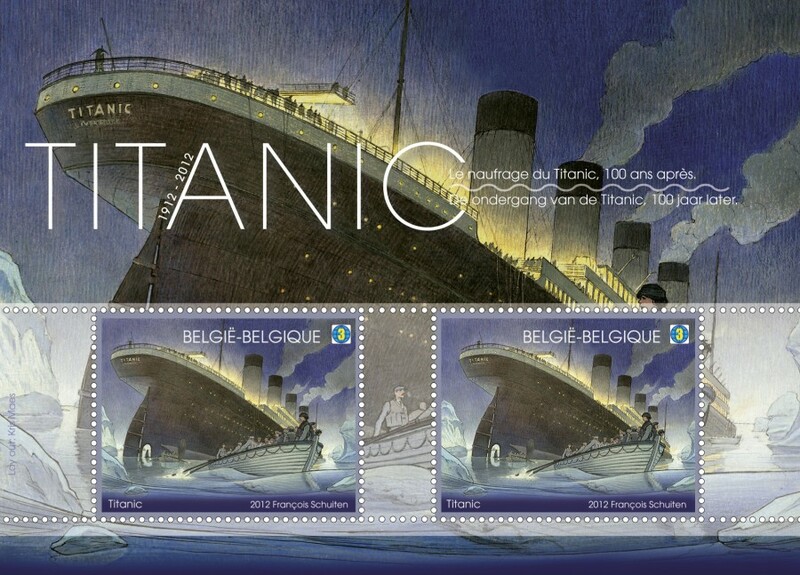 Bpost commemorates the sinking the Titanic with a 3D stamp, designed by François Schuiten and Kris Maes. The RMS Titanic of the White Star Line shipping company was built in Belfast and touted as an unsinkable ship. During the first crossing to New York, the ship collided with an iceberg and three hours later the ship was sunk. On the sheet are 2 stamps slightly different, but who put the 2 stamps together with a 3D glasses, you see the sinking Titanic in 3D. That is an absolute first for Belgium. The stamps have a face value “3” (World) and can be used to send on non-standard letters to a non-European country. The leaflet with the 3D glasses sold as a set and costs € 8.99. For more information see: http://www.bpost2.be/blog/nl/2012/04/16/3d-postzegels-titanic/ and read the philanews_2012_2_nl.pdf.